Although conspicuously absent from many classic textbooks on herbal medicine, alfalfa did find a home in the texts of the Eclectic physicians (19th-century physicians in the United States who used herbal therapies) as a tonic for indigestion, dyspepsia, anemia, loss of appetite, and poor assimilation of nutrients. These physicians also recommended the alfalfa plant to stimulate lactation in nursing mothers, and the seeds were made into a poultice for the treatment of boils and insect bites. Alfalfa: Common name: Lucerne. Botanical name: Medicago sativa. A member of the pea family it is native to western Asia and the eastern Mediterranean region. Sprouts have become a popular food and herbal supplements primarily use the dried leaves of the plant. The heat-treated seeds of the plant have also been used. Besides protein you have vitamin A, vitamin B1, vitamin B6, vitamin C, vitamin E, and vitamin K. Nutrient analysis also demonstrates the presence of calcium, potassium, iron, and zinc. 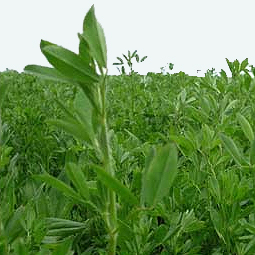 While the medicinal benefits are poorly understood, the constituents in alfalfa have been extensively studied. The leaves contain approximately 2–3% saponins. Animal studies suggest that these constituents block absorption of cholesterol and prevent the formation of atherosclerotic plaques. One small human trial found that 120 grams per day of heat-treated alfalfa seeds for eight weeks led to a modest reduction in cholesterol. However, consuming the large amounts of alfalfa seeds (80–120 grams per day) needed to supply high amounts of these saponins may potentially cause damage to red blood cells in the body.